Quinoa (pronounced keen-wah) has been called a super food and is actually the seed of a plant related to vegetables such as beet and spinach and is a great source of protein and nutrients. This grain was the staple diet of the Incas and was considered to be sacred and used to treat ailments such as appendicitis and even used as ointment to be placed on wounds. 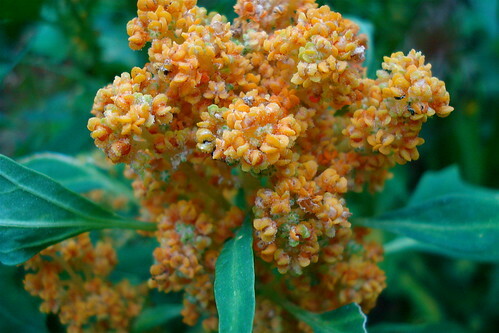 Both the seed and the leaves are edible even though most people are only familiar with the Quinoa seed which sometimes replace rice in dishes, is cooked as a pilaf or popped to make a form of popcorn used to garnish food. This little seed is considered to be the only complete protein grain and packs a whole lot of nutrients for such a tiny seed. It amazingly enough contains all 9 of the amino acids needed as building block for muscles in the body. When compared to other grains such as corn, wheat and barley, quinoa contains more zinc, potassium, calcium, iron, phosphorous, manganese and magnesium and on cup of quinoa contains an amazing 24 grams of complete protein which is 48 percent of the daily recommended value. As if this is not enough, quinoa is also a great source of omega-3 fatty acids, thiamine, copper, lysine, vitamin B6 and B2 and a good source of fiber. People suffering from allergies or Crohn's and celiac disease can benefit from eating quinoa as it is completely wheat and gluten free. It has been proven that quinoa and similar foods containing a high amount of insoluble fiber help to prevent breast cancer and gallstones. Quinoa can even decrease the occurrence of migraine headaches because of the magnesium content that helps relax blood vessels. Vegetarians and vegans doing weight training will also benefit from eating quinoa as it the lysine found in quinoa helps the body in building proteins. Because so many nutrients are found in Quinoa it is believed that it contains qualities that can assist in the prevention of cancer. The same nutrients will also contribute to keeping your heart and bones healthy. To make this grain more digestible it is recommended that you soak and rinse Quinoa thoroughly before cooking. Just like rice, Quinoa will expand and increase in size during the cooking process which is something to keep in mind when measuring your Quinoa for cooking. Once the Quinoa has soaked for a couple of hours and has been rinsed, pour it into a pot with double the amount of water. Bring the water to a boil, reduce the heat and cover the pot with a lid to allow the Quinoa to simmer. After about 15 minutes of simmering you will notice that the grains will become translucent with a white tail forming on each grain. This is an indication that your Quinoa is ready. You can either eat your Quinoa as is or season it with your choice of seasoning or salt before serving. I have tried quinoa but although I enjoyed it, hubbie was not so keen. It is a bit like couscous to eat and quite bland, mildy nutty and chewy - unless you do something with it. There may be other brands available but the one I tried came in a 450gm packet from Ceres ($6.95) – quite expensive! As it more than doubles in size when cooked, one packet for us was enough to see whether it was going to become a family favourite. I believe quinoa has a high protein content which is a little strange since it can be used as a substitute for rice which is mostly carbohydrate. It is quite light to eat however and nowhere near as heavy as pasta so you don’t feel so bogged down after eating it. I don’t know if the quinoa that we buy in NZ is different from the one the writer discusses (think this is a US article) but the quinoa I bought did not need any soaking before cooking. The instructions for cooking were on the packet and from memory, it took about twenty minutes by the absorption method. I cooked it in the microwave which was very simple. To give it more flavour, I tried cooking it in stock instead of water but it didn’t make a huge difference. If you are going to eat it without a sauce, it needs something added to it like chopped fried onion, garlic, chopped herbs, or crispy bacon, etc. A good wallop of grated parmesan on top is good too. In fact any of the ingredients you would use in a risotto work fine and you could probably could it risotto style. Quinoa would also work well cold in a salad if you like this sort of thing – again a bit like couscous. Or you could use it in soup like risone. I’ve read some people even eat it like porridge for breakfast. never even heard of it!!!!! This is a great addition to a vegetarian diet, as I can do a veggie stir fry, and serve it with this without needing to think what protein to add. I had used it in the UK but forgotten about it until now. It certainly does need something with it, but a good spicy thai curry or mexican stir fry would fit the bill nicely! I also like Wices idea of using it in a rissotto, I think that would work really well. Whilst its a bit more expensive than plain dried rice, its quite cheap as a protein source, and certainly cheaper than those precooked rice sachets, that have lots of salt and fat added. I love quinoa and recommend it to everyone I know. I enjoyed reading your story Becki. I had no idea about its Migraine reducing properties. It truely is a under utilised superfood!